Group from 7 to 12 persons max. Everyone who wishes to explore one creative and spontaneous part. Music and the singings will be present to support the opening of the heart, and everyone will be free to join or not the singings. Therefore, it is not necessary to know how to sing. 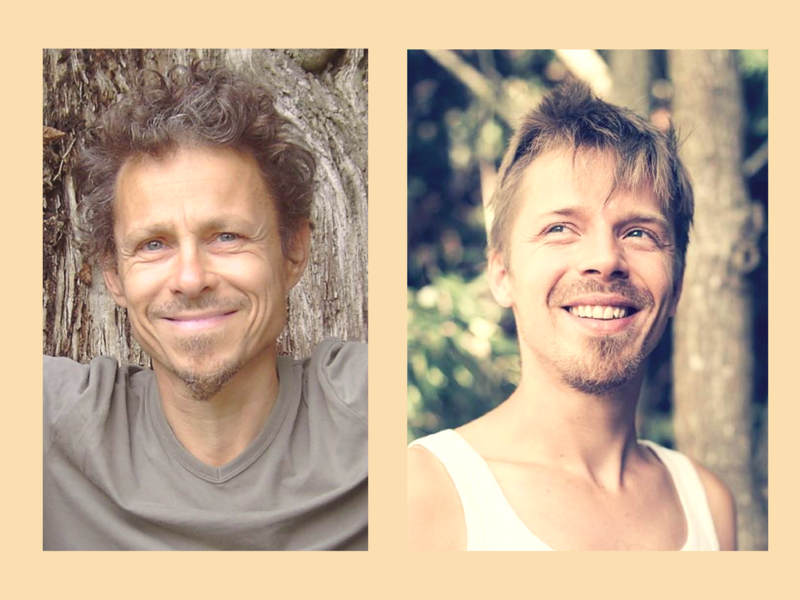 Fabrice George is body therapist and musician, he teaches the practice of the movement and the spontaneous singing since 2006 in Belgium and Switzerland. Joachim Nour will offer his enlighted music and singings. Mélodie du désert: our local guide Saïd and his team. – Meeting with the group at the airport of Ouarzazate. – On the road in taxi/small van from Ouarzazate airport to the village of Mhamid, at the border of the desert (half a day). – Dinner and overnight at Mhamid, meeting with Saïd our local guide to the desert. – Departure in the morning for our journey in the desert. – Return to Mhamid around midday, rest, and afternoon in Mhamid (optional: hammam, visit of the village), meal and overnight at Saïd. · days are divided between the walks (more or less 3 hours a day), the meals, the workshops, resting, the fire burning in the evening, the singing times. · Every night is spent in nomadic bivouac between sand dunes, under the tent or under the stars, for the suitability of each. · The meals are carefully prepared (generally bread and jams in the morning, mixed salad at noon, and meat stew in the evening. The supplied water is bottled. It is possible to adapt to different diets (vegetarians, intolerance), please inform us before the departure. · The local team is made of a guide, a cook and several camel drivers, all natives of the desert and passionate with their region. · Camels are in charge of carrying the gears for the bivouac, and the personal belongings. 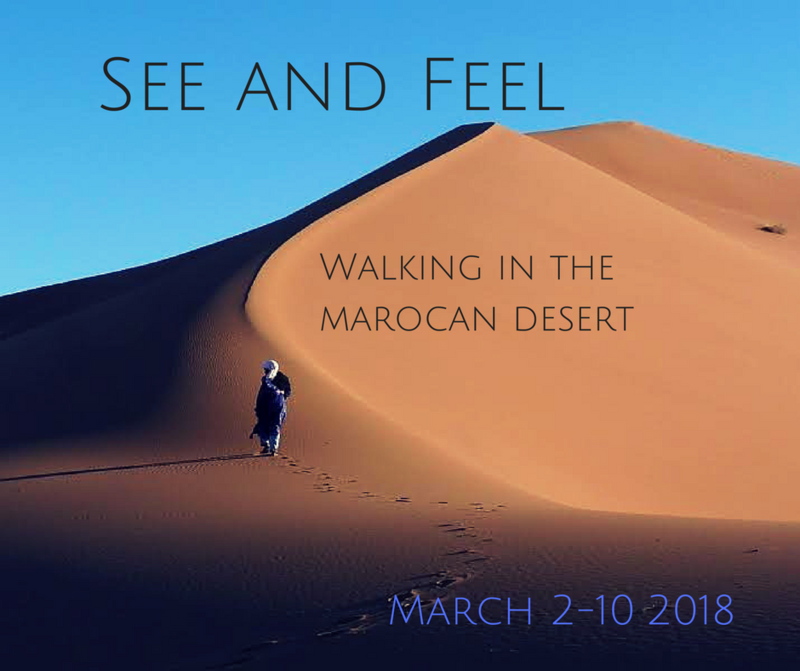 This price includes the transport from the airport of Ouarzazate to the village of Mhamid (1/2 a day), all the meals from March 2nd in the evening to March 10th in the morning, the accommodation in Mhamid from 2 to 9 of March, the trek in the desert from March 3rd to 9th, the guidance (talking circle, workshops, music and singing) and the preliminary individual interview. This price does not include the plane tickets, the meal expenses during transfers between Ouarzazate and Mhamid, the traditionel tip for the camel drivers and your insurances hospitalization and repatriation. – Contact me by telephone or e-mail. – We fix an interview (possible via Skype), according to the availability of each. To answer to your questions, to specify your expectations, to verify on both sides if we agree to live this journey together. – If the answer is « yes! » for both, a registration form will be sent to you. Attention: registrations are closing on February 15th, 2018.